We find ourselves in challenging times. Not since the middle part of the last century have we seen in our country such an apparent resurgence of hate speech and harassment, and threats and acts of violent hate crime. How do we help our students navigate the conflicting messages that they witness in the world around them? In Montessori schools, one of our mandates is to provide opportunities for children to find their personal moral center. What are many of the lessons in Grace & Courtesy and Cosmic Education intended to generate, but for a deeply felt sense of tolerance, respect, unity, and service – in short, a “spiritual equilibrium” (Montessori, From Childhood to Adolescence 73) from which our students can be architects and advocates for peace. Dr. Maria Montessori saw in the child “both a hope and a promise for mankind Montessori, Education and Peace 31). She dedicated her life to teaching others about the natural laws of biological and psychological development such that they could then align their service to children so to best aid the growing child to become their most natural selves: compassionate, empathetic, and integrated thinkers committed to the care of others. 1900 - Following her work at the psychiatric clinic in Rome, Maria Montessori is appointed director of the Orthophrenic School, a model school for training teachers of children with developmental disabilities. For two years, she experiments at the model school with materials to stimulate the senses. Montessori succeeds in fostering the development of some of the children to such an extent that they achieve the same results on state exams as typically developing schoolchildren. 1901 – Montessori begins a second degree - in education, experimental psychology, and anthropology - at the University of Rome, and visits elementary schools to do anthropological research. 1904 - 1908 – Montessori lectures in anthropology and biology at the University of Rome’s School of Education, incorporating her clinical observations of pupils in Rome’s elementary schools. 1907 – The first Children’s House (Casa dei Bambini) is opened in the San Lorenzo district of Rome. 1909 – 1910 – Montessori delivers her first training courses. 1911 – Montessori resigns her teaching post at the University of Rome, and gives up her private medical practice to concentrate entirely on education. 1911 – 1913 The Montessori method is put into practice in English and Argentinean schools, and is beginning to be introduced into Italy and Switzerland. Model schools are set up in Paris, New York, and Boston. 1913 – Montessori delivers the First International Training Course. Students come from European countries, Australia, South Africa, India, China, the Philippines, the United States, and Canada. Montessori travels to the United States for the first time, and founds the Montessori Educational Association. 1914 – 1915 – Montessori delivers training courses in Rome and the United States. 1915 – Montessori travels to the United States for the second time, accompanied by her son, Mario. She addresses the International Kindergarten Union and National Educational Association (NEA). At the Panama-Pacific International Exposition in San Francisco, a Montessori class works in a glass pavilion observed by visitors. 1916 – The Montessoris move to Barcelona at the invitation of the city government; Barcelona remains ther home until the coup in 1936 that brings General Franco to power. 1921 - The New Education Fellowship (today known as the World Education Fellowship) is founded, of which Maria Montessori is an active member and engages in heated debates with the leading educational reformers of the time. 1924 – Montessori’s meeting with Benito Mussolini (who had come to power in 1922) results in official recognition and widespread establishment of Montessori schools by the Italian government. 1926 – Montessori speaks on education and peace at the League of Nations in Geneva. 1929 – 1931 - Montessori continues to train and lecture in Europe. 1931 - Mahatma Gandhi, leader of the Indian independence movement, visits Montessori schools in Rome. 1932 – At the second International Montessori Congress in Nice, France Montessori delivers a lecture entitled “Peace and Education”. 1933 - The Nazis systematically destroy the Montessori movement in Germany, closing all Montessori schools in that country. 1934 - After conflicts with the fascist system under Mussolini, all Montessori schools in Italy close. 1939 – The Montessoris depart for India to deliver what was to be a three-month training course at the invitation of the Theosophical Society, which has been using the Montessori method to successfully combat illiteracy. 1940 - Italy enters World War II on the side of the Germans. In June, Mario is interned by the British colonial government in India as an enemy alien, and Maria is confined to the compound of the Theosophical Society. Mario is released in August. Still, the Montessoris are not allowed to leave the country until the war is over. 1939 - 1946 – Maria Montessori delivers training courses in India and Ceylon (Sri Lanka), and further develops the Cosmic Education Plan for the elementary years with Mario’s collaboration. 1946 – With World War II over, the Montessoris return to Europe. 1949 – Maria Montessori is nominated for the Nobel Peace Prize for the first time. At the Eighth International Montessori Congress in San Remo, Italy Montessori delivers the lecture, Human Solidarity in Time and Space. 1950 - Nominated for the Nobel Peace Prize. 1951 - Nominated for the Nobel Peace Prize. The “Hate Has No Home Here” campaign was coined by young children advocating for their community’s health. 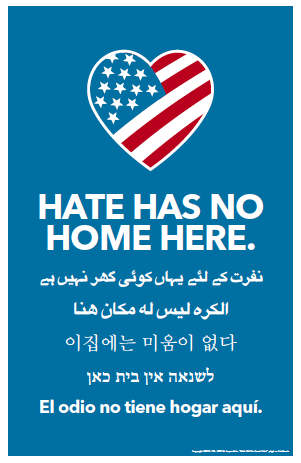 It is a powerful message of solidarity and sanctuary, one that calls for “safe places for conversation, work, learning, and living” (Hate Has No Home Here). The simple statement codifies what we stand for and what we do as Montessorians. As a public message, it is a defining stake in the sand - a declarative statement to all, and to ourselves - about the paramount work of educating for peace.